What a great marketing idea! They send me a coupon and offer me the opportunity to immediately browse their on-line store. This is a great call to action. But what about that QR Code? 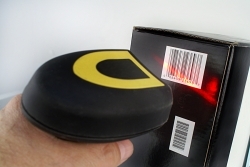 All bar codes contain data of some type. In this case the QR code contained the web URL for famous footwear. Scanning a code is really no different than having to type it in. So when browsing the web or visiting web sites, we can type in the URL address and hit enter; this takes us to our destination. In the case of the QR code, that data is already embedded in the QR code, so when scanned, it automatically tells the application to go to the specified URL web address. As always scanning is a quicker more efficient way than having to type by hand. QR codes also typically embed other data to help with marketing campaigns. For example, the QR code I received, most likely has some info in there that tells Famous where the scan originated from, which marketing campaign I was responding to, and maybe even who the scan originated from. This helps marketing determine which campaigns are working, and which ones are not. 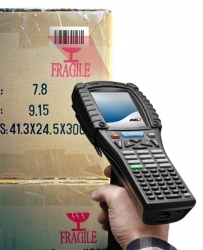 For help with buying QR code label software or label printers, contact George Righter today. 215-493-7191 or email.